Design engineers don’t have to give up the 2D world to benefit from large-scale 3D layouts. It’s all about getting the best of both worlds. In the CAD and process engineering world, the 2D versus 3D argument is still going on. But for CAD Schroer it’s the right mix of – and the seamless integration between – 2D and 3D that counts. Its software is designed to bridge the gap, helping engineers to people build 3D factories on a rich 2D legacy, for example. 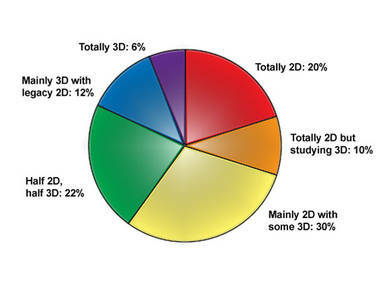 According to a recent Cadalyst survey 73% of companies use a mix of 2D and 3D CAD. About 20% work just in 2D, and only 6% work just in 3D. A mix between 2D and 3D is the most widespread scenario, with companies looking for a flexible solution that delivers both disciplines, helping to meet the diverse challenges faced by manufacturing and engineering organisations. Legacy data are a significant corporate asset. They are often used as the basis of new projects, ensuring design consistency and accuracy, and saving considerable time during the concept stage. CAD Schroer’s solutions allow companies to integrate existing 2D CAD drawings and raster data into new projects, with the ability to subesequently derive new 2D data or create new 3D models. Factory layouts are typically done in 2D. 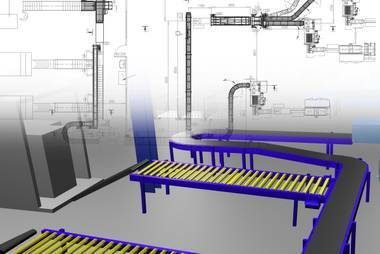 But in the world of process plant or factory design, where there is a need to lay out complex piping systems or plan process lines on different levels, a 3D approach with clash detection becomes essential. And in highly competitive sales situations, 3D visualisation is a great differentiator. CAD Schroer, experts in hybrid 2D/3D software, helps get the mix right by allowing designers to build on their 2D investment. 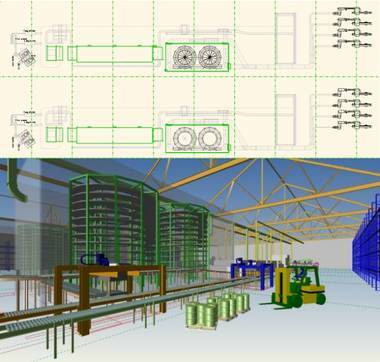 Its plant design and factory layout software is easy to implement, and allows 2D users to jump on board quickly. The software offers a 2D to 3D approach, using existing 2D layouts to quickly build a 3D world. Engineering disciplines like piping, steel and HVAC are provided through parametric 3D component libraries with auto-routing and auto-modelling tools. 2D drawings are automatically generated from models, and easily edited with the integrated professional 2D drafting system. Old and new 2D and 3D data thus combined in one project can be checked for inconsistencies and interferences, and visualised in 3D. “Few companies can afford to throw away their 2D legacy. We say: don’t. We’ll help you build on it, either by providing the software that makes a transition easy, or through our factory modelling services – the quickest way to get going with large-scale 3D,” Dr Schwelm concludes.